It's a feature that has benefited humanity tremendously since its inception, and now, it's even more comprehensive. Apple Maps is upgrading their app to include subways, trains, new flyover views, and even robotically-determined floorplans inside of buildings. Plot your commute or view your dream vacation, all in the palm of your hand. According to the Daily Mail UK, the Maps app will be updated for iOS 9, which will launch in San Francisco next month. Included in the revamp will be bus, train, and subway navigation abilities, which are critical to residents and visitors alike in major cities. Because for some of us, getting home is an adventure. A patent has also been filed by Apple to develop a "Commute Assistant" for real-time travel information. This is also thought to be debuting with the launch of iOS 9. Having recently absorbed the HopStop, Locationary and Embark travel-app firms, Apple's information spectrum will be boosted considerably. The new Maps app will not only include travel times, routes, and stops for the various forms of public transport that it displays, but will also notify users of possible route changes and delays. A constantly-informed "dynamic focus table" will assure users of the quickest possible method to their destination. Never be foiled by crappy paper updates in the subways again! Apple has also released autonomous robots with iBeacon sensors to do their bidding in buildings, mapping out interior spaces for even more thorough travel navigation. The robots, which are similar in size to iRobot’s Roomba vacuum cleaners, are like the inside version of the autonomous cars that provide street-mapping services. Though they can't provide routes for your hang-glider, wingsuit, or jetpack yet, Apple also boasts an impressive library of city flyovers. Today, several more flyovers were released, including numerous major U.S. cities, Edinburgh, Scotland; Linz, Austria; Venice, Italy; Cáceres, Spain; Rennes, France; Guadalajara, Mexico and Ponce, Puerto Rico. 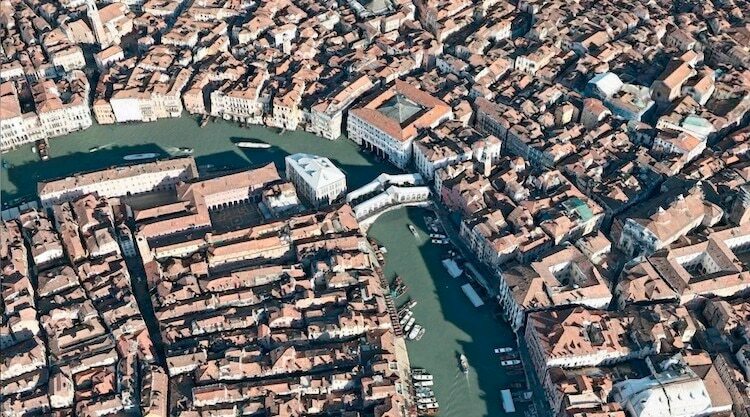 Venice: now for floating AND flying! "Flyover in Apple Maps lets you see select major metro areas from the air with photo-realistic, interactive 3D views," the company explains. "You can explore cities in high resolution as you zoom, pan, tilt, and rotate around the city and its landmarks." So even if you can't afford to actually be IN the country, you can still do a fun flyby-version of travelling there! And you're lucky enough to be roaming around on the ground, now you'll know where, when, and how to go! For those bound by the ground, fresh flybys are always fun.